MADISON, Wis. (KTRK) -- He's in. Wisconsin Gov. Scott Walker officially entered the 2016 Republican presidential contest this morning with a tweet. "I'm in. I'm running for president because Americans deserve a leader who will fight and win for them," Walker posted on his Twitter page. He enacted policies weakening their political power and became the first governor in U.S. history to defeat a recall election. Now, on the eve of his campaign launch, Walker's task is to remind Republican voters about the four-year-old fight and the recall election sparked by his efforts to weaken unions - and a series of lesser-known triumphs he says set him apart from the crowded Republican field. "If you could accomplish half of what he's done in Wisconsin in Washington, D.C., you would go down as one of the greatest presidents ever," said Walker's top political adviser Rick Wiley. 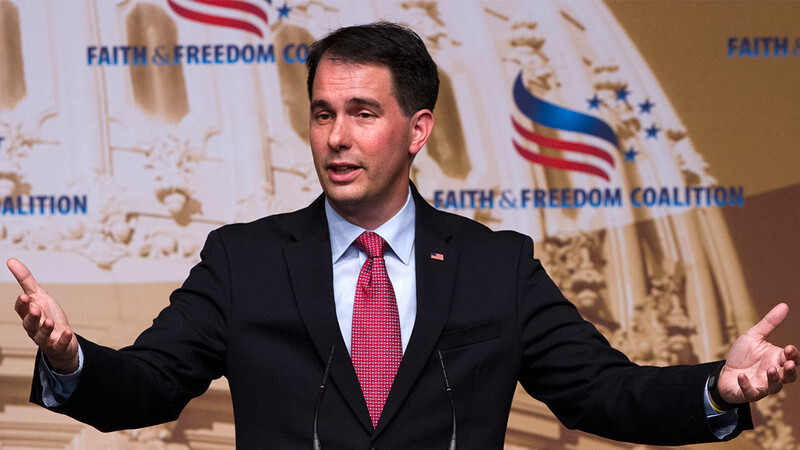 Such achievements may appeal to conservatives who hold outsized sway in Republican primaries, yet some could create challenges in a general election should Walker ultimately become the GOP's nominee. Voter ID laws, abortion restrictions, liberal gun policies and education cuts are not necessarily popular among swing-state independents. "Ultimately Walker has to show all these victories and political successes have shown real results," said Democratic pollster Paul Maslin. Walker's record is well-known to Wisconsin voters, a state where the second-term governor engenders fierce loyalty and fierce opposition. Protesters who first crowded the state Capitol in 2011 in demonstrations as large as 100,000 still gather daily, although only about a dozen or so at a time, to sing anti-Walker songs. Anger over Walker's 2011 union law led to the failed 2012 recall. His team created a video this week, called "Recall the Recalls," to tell that story again, especially for those who are taking their first serious look at Walker as a presidential candidate. And while he's not yet a presidential candidate in the eyes of the law, the labor dispute helped give him a significant head start in the 2016 money race. Walker's three governor's races left him with a far-reaching donor database of more than 300,000 names. He shattered state fundraising records, collecting $83 million for his three Wisconsin elections, much of it coming from outside the state. Walker's union clashes will be featured prominently on the day of his announcement, to be held in the same convention hall where he hosted his victory party after the recall election. "A lot of people, that was their first introduction to Walker," Wiley said, calling the union battle and subsequent recall win "one of our biggest assets." Yet the specific impact of Walker's fight with labor unions is open to debate. The governor often highlights rising test scores and graduation rates as evidence that the 2011 union law worked. What he doesn't mention is Wisconsin's graduation rates were increasing for years before he took office, and the recent growth is not as strong as the national average. Wisconsin's ACT scores have been among the best in the nation since before Walker was elected. They ranked third the year before he took office and ranked second in 2012. Walker also talks about how the 2011 union law saved taxpayers $3 billion as of late 2014, saying state and local governments have used "tools" he provided them to reduce spending on pensions and health benefits for public employees. While it's true that the state and local governments have saved roughly that amount, the costs have been shifted to the employees who have to pay more for those benefits. Critics note that Walker too often ignores where he's fallen short. The state's chief economic development agency that Walker created, a hybrid public-private partnership, has been beset with problems, including handing out $124 million in loans without properly vetting the recipients. Walker was over 100,000 jobs short on his signature 2010 campaign promise to create 250,000 private-sector jobs. Wisconsin's job growth has lagged not only the national average but its Midwest neighbors as well. He's also been dogged by two investigations, neither of which have yet to result in charges filed against him. The first resulted in a variety of criminal convictions, including misconduct in office, against six of his former aides and associates when he was Milwaukee County executive. The second investigation, currently on hold while the state Supreme Court considers a trio of lawsuits, centers on whether Walker's recall campaign illegally coordinated with independent groups.